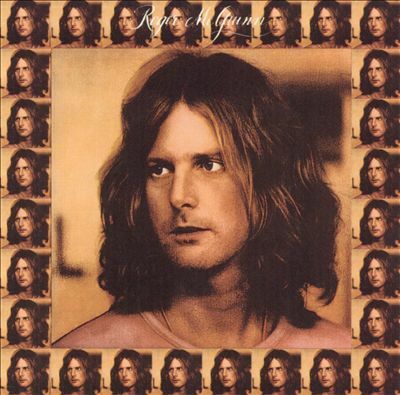 Author’s note, Oct. 11, 2014: The following is an expanded version of my Roger McGuinn interview, a shorter version of which was first published at MP3.com on April 2, 1999. The site was offering artists a new way to release their music online independently, without a major record label in the middle. At the time, the record industry was battling digital downloads; websites like MP3.com, artists like McGuinn and music journalists like yours truly who wrote for such sites were considered traitorous. History has proven otherwise. Once Apple established the business model for digital downloads with iTunes, it was all over for the old-school record biz. 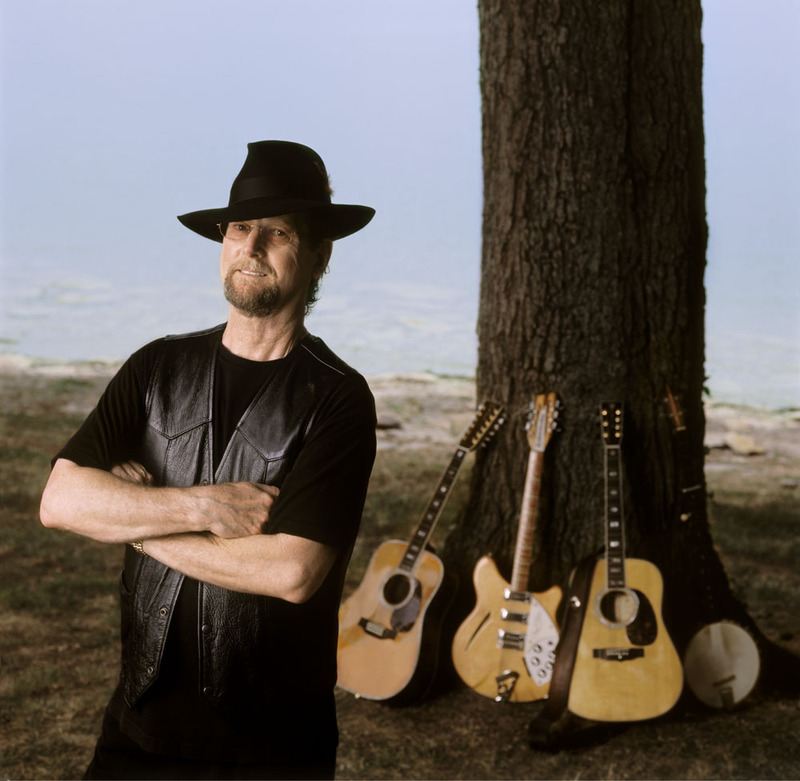 James Joseph McGuinn III, better known as Roger McGuinn (and before that Jim McGuinn), is co-founder of The Byrds and a 1991 Rock ‘n’ Roll Hall of Fame inductee. His roots are in folk (Chad Mitchell Trio, Bobby Darin), and he is now using the Internet to preserve and further the folk tradition. He has several vintage and recent tracks posted on his MP3.com page, where his “McGuinn’s Folk Den Vol. 1” CD is also now available. This writer is a first-generation Byrds fan, a junior high school kid in Miami, Fla., in 1965 when their Beatles-inspired folk-rock version of Bob Dylan’s “Mr. Tambourine Man” jangled to No. 1. More than a decade later, in 1978, I met McGuinn when serving as editorial director in the press and artist relations department at Capitol Records in Hollywood. Bruce Garfield was the department head and my boss. My photographer friend Henry Diltz caught the moment on the Tower’s 9th floor. I had the honor of writing the liner notes for the “McGuinn, Clark & Hillman” album cover, released by Capitol that year. The album was produced at Criteria Studios in Miami by my former high school mates Ron & Howie Albert. “McGuinn, Clark & Hillman” made the charts and “Don’t You Write Her Off” was a Top 40 single, but we were all disappointed the album didn’t do better. McGuinn and I last met a few years ago  when he played the historic Troubadours of Folk festival at UCLA, produced by Ted Myers. Backstage, McGuinn introduced me to his friend Tom Petty, who’d shown up to sit in with him. (I’d interviewed TP at ABC Records in 1976, between the first and second Tom Petty & The Heartbreakers albums for a story in “Rock Around the World.”) At UCLA, I introduced both of them to my friend Richie Havens, for whom I’d been doing press as a national PR director for Rhino. They had all crossed paths before; it was some reunion. So I just shut up and enjoyed listening to the three folk/rock legends shoot the breeze. 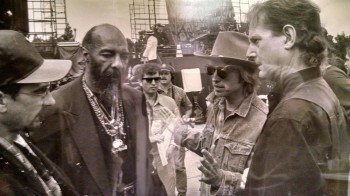 Another friend, photographer Peter B. Sherman, was shooting the festival and captured that moment (festival producer and Rhino A&R exec Ted Myers is the guy in shades between Richie and TP). While researching another story recently [spring 1999] I discovered McGuinn’s MP3.com page and his own homepage, and had to re-connect with him. Knowing his history, I wasn’t surprised to see he was still very much into bleeding-edge technology, right along with all the youngsters just starting out. We swapped emails on Good Friday, April 2, 1999, McGuinn at his home in sunny Orlando, Fla., and yours truly 3,000 miles away in sunny Santa Clarita, Calif.
Stephen K. Peeples: People who know your background know what a gadget/tech nut you are, and the story behind adopting “Roger” as your first name. When we first met, in 1978 at the Capitol Records Tower, I recall you had a big, bulky portable phone, and that was your latest gadget. Am I remembering correctly? And who the heck were you TALKING to back then? Roger McGuinn: What I had then was a briefcase telephone, a 25-watt VHF full duplex transceiver that connected to the commercial land mobile telephone service. I could make calls to, and receive them from, anyone in the world. I did then what people do now with cell phones, but back then you could use them on airplanes. I have some great road stories of how the phone saved the show. I got my first one in 1971. SKP: Please give us a short history of your involvement with computers and the Internet. RM: My first computer was a gift from my mother, in 1980. It was a small Radio Shack TRS-10. Then I was given a Color Computer, based on Motorola’s 6809e chip set. I hacked that to do all of our [accounting] books. 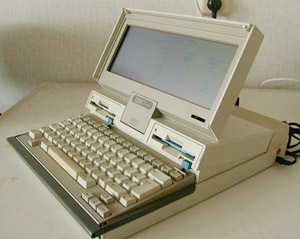 Then I got an IBM Convertible (pictured, courtesy Wikipedia), one of the first laptops. There has been a succession of 286, 386, 486, and Pentium machines since. Most of them still work. I got online in the early ’80s with a commercial service called Easy Street. We used that to communicate from home to the road, even from Europe. Then I got on CompuServe, Prodigy and America Online. I discovered the Internet in the early ’90s using Usenet and email, then the Web a year or so later. I found that a good ISP was better than the services I’d been using. 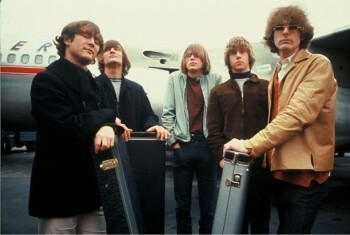 The Byrds, Columbia promo photo, 1965: David Crosby, Gene Clark, Michael Clarke, Chris Hillman, Roger McGuinn. 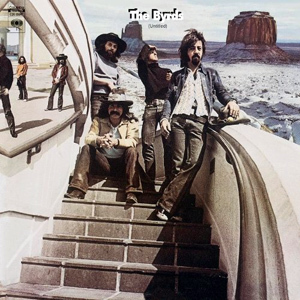 RM: After writing a Byrds FAQ and posting it on alt.music.byrds, I got an offer from Kenton Adler at the University of Arkansas to host a Byrds Home Page. I contributed to that for a year or two, and then gradually built my own home page. My virtual domain name http://mcguinn.com is hosted by a local Orlando ISP. That’s a funnel to my Web site hosted by the University of North Carolina’s MetaLab. UNC’s Paul Jones offered me Web space on their site so I would be able to present my Folk Den songs in streaming technology by RealMedia. I’m the Webmaster of my site and do all the HTML work and media updates myself. SKP: Tell us more about the Folk Den — its mission, and how you have posted a “new” folk song there each month for the last few years. RM: The idea of preserving traditional folk songs on the Internet came to me, after I began to develop a concern that these songs might get lost in the strict formatting of the commercial music business. 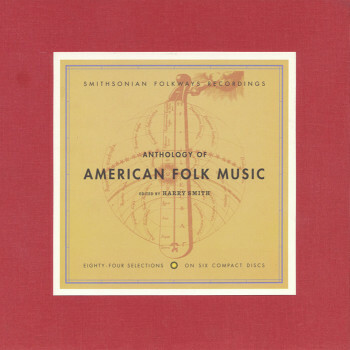 Very few radio stations were playing these wonderful songs, and the new breed of “folk singers” were writing their own material. I wondered what would happen when Pete Seeger and Odetta passed away. So I decided to do my part, continuing the folk process — that is, the singing of songs and telling of stories in the oral tradition, but on the Internet. 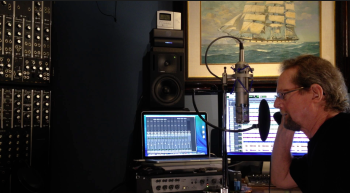 So each month I record a traditional folk song in my digital home studio. I format these songs as .WAV, RealAudio and sometimes MP3 files. They are free. I’ve made a CD of some of these songs available through MP3.com, and plan to release more CDs in the months to come. SKP: Is it fair to say that some of your recent recordings sound a lot like your earliest recordings? RM: Yes, and actually one of the songs on my “McGuinn’s Folk Den, Vol. 1 CD,” “John Henry,” was recorded in 1959. Roger McGuinn and Folk Den axes, Nashville, 2005. Courtesy photo. SKP: No wonder it sounds so adenoidal! Now, who among the current generation of folk artists do you see carrying on that same tradition and spirit? RM: Dar Williams, Wilco and Son Volt come to mind. SKP: Back to the tech stuff — at what point did you get into streaming audio and video, and MP3? RM: As soon as I got on the Web, I found RealAudio. It took me a while to get it working, but now I use it every day. In 1995, a friend’s son came to my house and downloaded my first MP3 encoder for me. I loved the idea of being able to compress CD quality files into such a small space. 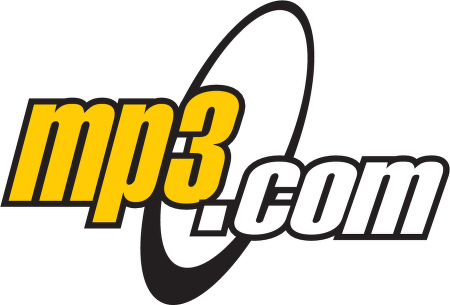 SKP: Tell us how you connected with the MP3.com website as an outlet for your music. RM: Someone from the site contacted me and asked if I had anything I wanted to post. 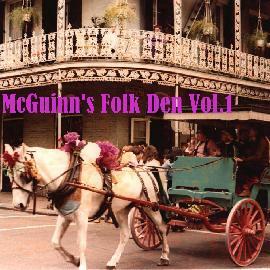 “McGuinn’s Folk Den, Vol. 1” has been on MP3.com for just over a month [as of 4/2/99]. The first week I was Pick of the Day! Already my track “James Alley Blues” has reached the MP3.com Weekly Top 10. I’m very honored to have reached this position on the foremost MP3 website! The exposure is tremendous. My songs get thousands and thousands of downloads! And MP3.com has been great to work with. SKP: What kind of emails are you getting? Fans? Industry? Long-lost one-time accomplices like me? RM: Both fan mail and industry invitations have resulted from my being on MP3.com. Lots of old friends have discovered where to find me. SKP: Are you seeking a major label deal right now, or would you rather stay independent? RM: The idea of being told what to do by a record label is repugnant to me at this point in my life. I really love being able to create whatever music I like and post it. Some record company would have to come up with an awful lot of money to get me to sign with them, and they aren’t going to do that. SKP: What’s your take on SDMI (the Secure Digital Music Initiative of 1998) and similar efforts to curb illegal digital copying of music on the Web? What do you think will happen? RM: There are too many ways for MP3 files to get around on the Web for anyone to be able to regulate them. I enjoy being on the legal side of the MP3 wars. We’ll just have to see how it all plays out. This reminds me of FM radio in the late ’60s when the free-form format was starting. It was an exciting time for music! SKP: What do you think about the convergence of media on the Web? RM: It’s inevitable, and I like it very much! I like the idea of a one-stop box that will cover all of your communication needs. SKP: Back in the analog world, how often do you go out to play gigs? RM: I spend between 50 and 100 days a year on the road. This year many will be in Europe. You can always see where I’ll be at http://metalab.unc.edu/jimmy/mcguinn/tour.html. 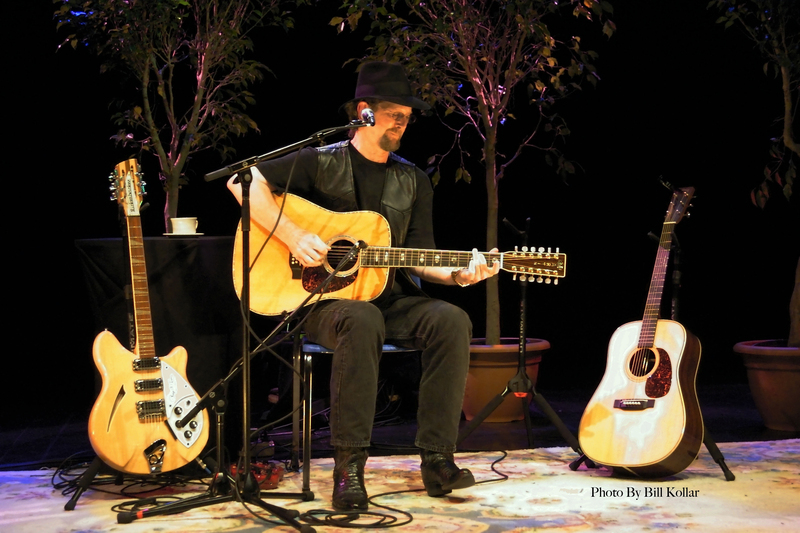 Most of my shows are solo, with my Rickenbacker 12-string and my new Martin D12-42RM 12-string guitars (pictured; photo by Bill Kellar, courtesy Roger McGuinn). Sometimes I use a band as well. I’ve played with Wilco recently. SKP: Tell us about your new Martins. 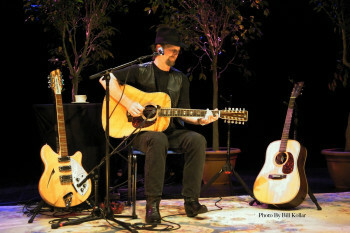 RM: The Limited Edition D12-42RM Roger McGuinn 12-string is a 14-fret Dreadnought. There is a lot more information about it at my website. RM: “The James Alley Blues” is Song #61 in the Harry Smith Anthology. It was originally recorded by Richard (Rabbit) Brown in New Orleans, on March 5, 1927. Brown was one of the first musicians to learn the 12-bar blues pattern, and was one of the most important New Orleans folk singers to record. He was famous for his dramatic guitar playing, which was similar in style to that of bluesman Willie Johnson. I have tuned to the key of the original recording, which is somewhere between C and C#, and have emulated the tempo and blues licks Brown played. RM: An old Irish tune, but these words were added later for music-hall use during the Victorian era. Some Irish people have objected to them as an English-inspired stereotype, but I first heard this song sung by the Clancy Brothers and Tommy Makem, at the Gate of Horn in Chicago, in the late ’50s. To me, no one was more Irish than they were. RM: The legend of John Henry dates back to the early 1870s during the building of the Big Bend Tunnel through the West Virginia mountains by C&O Railroad workers. To carve this tunnel, then the longest in the United States, men worked in pairs to drill holes for dynamite. One man used a large hammer to pound a huge drill, while another man screwed it into the rock. John Henry was renowned for his strength and skill in driving the steel drills into the solid rock. One day the captain brought a newly invented steam drill to the tunnel to test. Which was stronger, man or machine? John Henry, the strongest steel driver of them all, beat the steam drill, but according to the song, the effort killed him. SKP: “John The Revelator” — and c’mon, who’s the anonymous backing singer?! RM: This was recorded originally in 1930 by Blind Willie Johnson. He was one of the foremost African American singers of religious songs, with 30 records to his credit. On his recording of this song, his wife, Angeline sang the answer-back part. I have tried to keep as close to the original sound as possible, but the person who sang the answer-back part on my recording would prefer to remain anonymous. SKP: Of course, “Mr. Tambourine Man” will be on it. I’ve heard the tape of the complete session with [producer] Terry Melcher and the Wrecking Crew guys [including Hal Blaine on drums], all 22 takes or whatever it was. It’s a revelation. What you were thinking when you guys nailed “the keeper”? RM: The feeling was one of joy and disbelief! We couldn’t fathom that we’d created something so overwhelming. 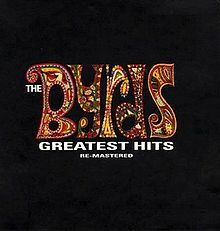 SKP: In general, have you been okay with how Sony/Legacy has handled the Byrds catalog? How involved have you been? RM: I’m very happy that the Sony reissues are coming out now, and are of such high quality! I have been involved in the mixing of the last eight CDs. Bob Irwin does an excellent job with the remastering. SKP: What do you think of the work the writer John Rogan [author of the 1980 Byrds bio “Timeless Flight”] did to document the band’s history? RM: At first I found Rogan’s work lacking in factual detail and overburdened with personal opinion. Now with the  release of “Timeless Flight Revisited” I find that he has corrected the problems that had bothered me in his previous work. The liner notes for “The Byrds Greatest Hits” are excellent in their attention to detail. SKP: What else is in the wings? RM: “Untitled,” “Byrdmaniax” and “Farther Along” will be out this summer. They all sound great, complete with bonus tracks! SKP: How about your SOLO catalog? That is also worthy of a boxed set, or at least a two-CD anthology! RM: So far Sony hasn’t shown any interest in releasing my solo albums on CD. 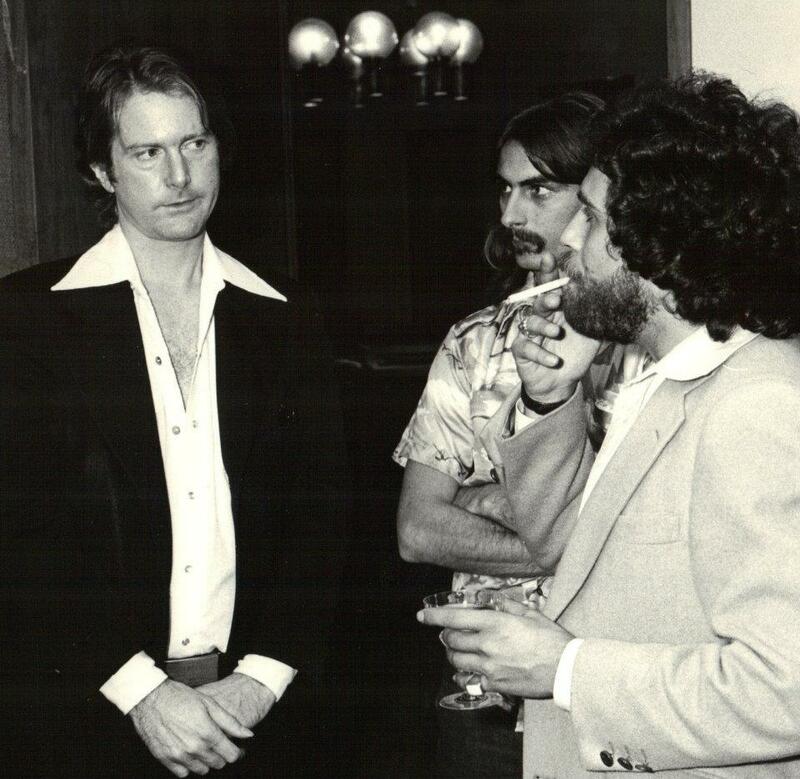 My first [“Roger McGuinn,” Columbia, 1973, pictured] is out on Edsyl. You can find out more about it at http://metalab.unc.edu/jimmy/mcguinn/RM.html. SKP: What’s your plan for the next several years? RM: Andres Segovia was scheduled to play Carnegie Hall the month he died. He kept doing what he loved until he couldn’t do it any longer. That’s what I plan to do! 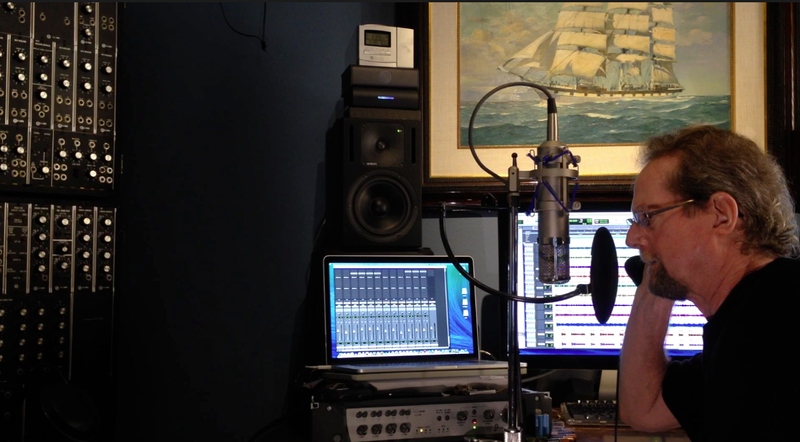 Roger McGuinn in his home studio in 2014, still doing what he loves. Courtesy photo. Santa Clarita journalist Stephen K. Peeples was the original, award-winning producer of “The Lost Lennon Tapes” radio series for the Westwood One Radio Network from 1988-1990. Peeples, a Grammy-nominated record producer (“Monterey International Pop Festival,” MIPF/Rhino, 1992), is a veteran record industry media relations executive (Capitol Records, Elektra/Asylum Records, Westwood One, Rhino Entertainment, 1977-1998) and website content manager (Warner New Media, 1998-2001). Opting to work closer to home, he was music and entertainment features writer and columnist for the Santa Clarita Valley Signal (2004-2011), and soon became an award-winning online editor (The Signal website, 2007-2011). Today, Peeples is Vice President/New Media & Editorial with Los Angeles-based multimedia pop culture company Rare Cool Stuff Unltd. He also writes features for Santa Clarita’s KHTS-AM 1220 News (www.hometownstation.com) and SCVNews.com, and hosts, writes and co-produces the WAVE-nominated “House Blend” music and interview television show on SCVTV, community television for the Santa Clarita Valley. For more information, email skp (at) stephenkpeeples.com or visit http://www.stephenkpeeples.com.